Does anyone track the popularity of Dominion in the board game industry? In my opinion the continual updates of new Expansions has kept Dominion popular, but I am curious if there are popularity trackers (from US / Europe and Worldwide). I am surprised that there are not more postings in the News forums about Dominion's success. Thanks. 1 million copies, as of "the end of 2010"! When Dominion was run by Goko and Making Fun, ragingduckd had a plot showing the number of Dominion games played each day. I don't think such a plot exists for Shuffle IT but you should be able to get an estimate by checking how game numbers change between days (assuming it always counts up by 1). If you poke someone with access to the raw stats (people who work on Dominion Scavenger), maybe you can get estimates that way. I think it's something like 35k games a day on Dominion Online, about a third of which are rated games. Obviously f.ds != Dominion, but there is surely a strong correlation between the popularity of the two. So here are some graphs about f.ds from 2011 to 2018. Each data point is a percentage of the average for that series. The raw data can be found here. 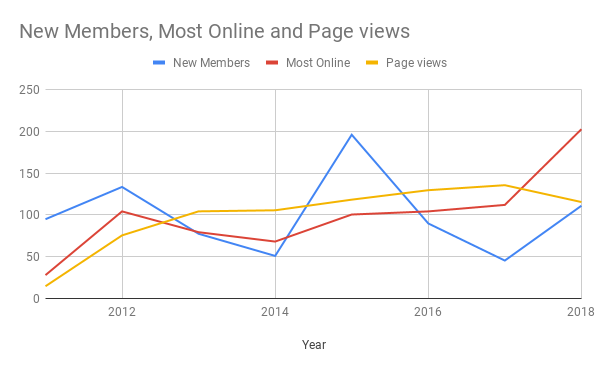 So the number of new topics and new posts has been steadily declining since 2012. However, most people online and page views have been generally increasing. There seems to be no particular trend for new members; I suspect the peaks coincide with the release of popular expansions etc. My conclusion is that compared to 2012-13, Dominion has a bigger fanbase as there are more people checking in on the forums. However, people are generally less excited about the game now, so there is less content being posted. I'm not sure how much of an effect forum games, RSP etc have. A lot of active f.ds people now mostly hang out in mountainpassbiddingstrategy.com (Dominion discord). That should explain some of the forums popularity decay. The Dominion League is bigger than it has ever been. 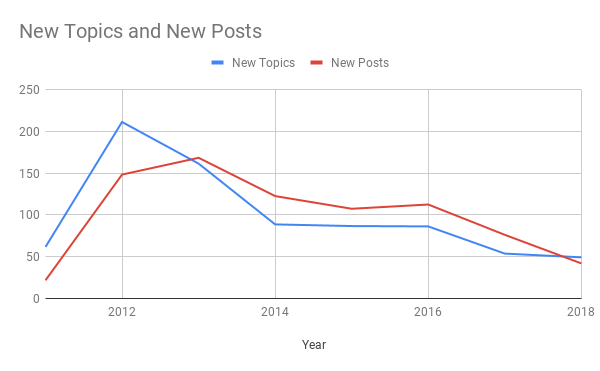 So the number of new topics and new posts has been steadily declining since 2012. However, most people online and page views have been generally increasing. 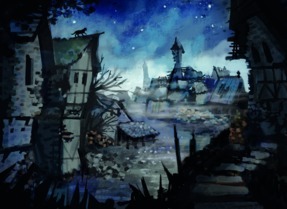 Speculation: when a lot of stuff has already been discussed, and previous threads are frequently referred back to, when the forums are full of very experienced players some of whom are quite disdainful of newcomers, you need to be pretty sure of yourself and pretty confident you have something new and useful to say before you comment. This might contribute to the drift in comment to page-view ratio. My new thread frequency has exponentially decreased since game logs and game kingdoms are no longer available/pretty. This is the problem I've found too. It's currently very hard to share game logs or read game logs unless you have a subscription. I don't play frequently enough to justify buying a subscription which means that on the off chances where I do play a neat board, I have no way to share my log anymore. Yeah. It still boggles my mind that Goko and Making Fun each had easily accessible logs for games, yet Shuffle iT—created by two top players—has yet to truly implement them. This thing where you can go back into old games is cool, but does not count! And as far as I know isn't available in bulk. And don't they "go bad" when an update happens? My understanding is that Isotropic and Goko both stored raw text logs of what happened in each game to a local server or AWS, but didn't store much metadata past that. However, because the raw text logs were public, people could build tools to process the text logs to reconstruct metadata that let them implement log search, Council Room analytics, the Isotropish leaderboard, and so on. In contrast, Shuffle IT stores the decisions of the game in binary format in a password-protected database, which is more efficient for storage but also means the data isn't natively human readable. There are probably reasons that doing it this way makes it easier / actually possible to implement the game-replay and undo features, but the flip side is that the raw text isn't actually saved. I wonder if the uptick in "most online" for 2018 can be explained by the influx of Dominion League members that was seen when the Dominion League was advertised on Shuffle iT Dominion Online. This is without a doubt the cause of the League uptick, and with so many being new accounts it only makes sense. Correct. We see massive spikes in the numbers of new users every time we make a client announcement. You can see that in the stats by digging into the Forum History. For instance, there were 95 new users on March 20, 2018, the day our first client announcement went out, far more than the 2017 daily average of 1. Here's a hot theory: The stats look worse than they actually are. The people posting here then are all on Discord now. That's where all the hot conversations are going. The Discord community has been siphoning off of the forum users for a couple of years now, and now with League being conducted mostly on Discord, the numbers should start dropping even further. I'm not a Discord user, but by my understanding it's ephemeral? Isn't that a problem for conversations people might want to refer back to years later? The only reason to refer back to old strategy discussions is to laugh at how wrong people were. Also you can still look up the old discussions if you want, it's just not terribly convenient. The only reason to refer back to old strategy discussions is to laugh at how wrong people were. This is not true for things that are taken for granted now, but once had to be learned. For example, I doubt anyone will learn that Ambassador should return two Coppers over one Estate from Discord, but they could easily learn it from searching the Forum for old discussions about Ambassador. I think that makes the Forum better for people who are new to Dominion. They can also learn that by playing one Ambassador game online. Anyways, I mean forums are a dying system. Nobody uses forums anymore. Yeah, it's a real concern, but just about everything else is better with Discord versus a forum. And we have articles, we have the forum anyways. People still post there, it's just a lot less often. If you had posted this on discord, and I'd been around, I would have replied immediately. If I hadn't been around, I wouldn't have replied at all. Given that it's a forum post, I saw it, didn't feel like putting in the effort at the time, and here I am replying to it the next day. So to me it seems like, in terms of the flow of conversation, a post on discord is more ephemeral. In terms of storage, they're just as stored and awkward to search. Like many forum sites, this one started as a front page of articles you could reply to with comments. Forums are a better version of that and took over. The current front page would be well served by generating a forum discussion thread for each article, say in the articles forum. Anyway the forums are a good version of article replies, but discord works fine for that too. Discord is better for chatting, which turns out to be a lot of what people want to do - less-thought-out conversations that occur in real-time. Forum games, it depends, discord or forums could be better. If you want to re-read pages of mafia discussions, okay, forums, but I have to think people are playing mafia on discord right now and loving it. Things like tournament reports are currently handled by youtube, with some discussion happening on discord. Discussing strategy works fine on discord. Discord has, by convention, a lower barrier to entry on posting. For some people it's the same - hey it's just a convention. But for many, a post is more intimidating, suggests that more thought be put into it. Now maybe you want to be reading stuff that more thought went into. I personally think the lower barrier to entry is way better. It encourages posting, meaning it's more likely that there's actually something to read. So, I recommend joining the discord. I don't think discord is just killing forums - note that a zillion sites still have articles with comment sections. But for sure a lot of our traffic has shifted there.